Buy this and your school gets £16.55 to spend on books Orders of £10 or more will earn 25% of your order value back in Scholastic Rewards for your school. Explore your world with DK Braille! Want a series that shows you the world in touchable pictures and clear braille text? A series that focuses on things that excite you: animals, vehicles and cool stuff? Here it is! 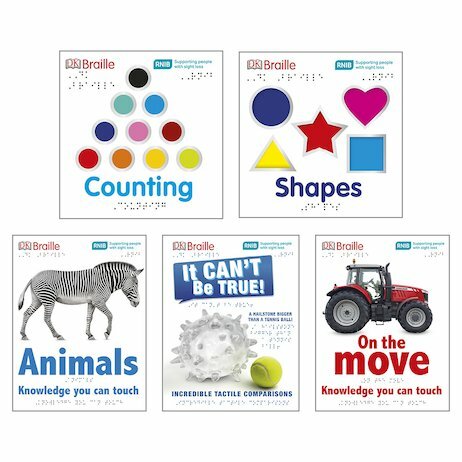 DK Braille covers all your favourite topics. But you won’t just read about them. You’ll touch and feel everything too! Each page is written in braille and large print, with exciting high-contrast pictures. Plus – the pictures are touchable, with embossed details and more. At last: braille books where the pictures reach out to you. Like DK say, it’s knowledge you can touch. DK Braille: It Can't Be True!